The summer of 2014 was a banner hiking season for us. We’ve already told you about our amazing Wonderland adventure in Mount Rainier National Park, but, believe it or not, that trip was just the icing on the cake. We actually began our hiking adventures in India, of all places. That’s right, India! As soon as school let out, we headed to India’s Uttarakhand, where we spent 11 glorious days trekking in the foothills of the Himalayas. What’s that you say? Uttara—where? If you’ve never heard of this region, you’re probably not alone. 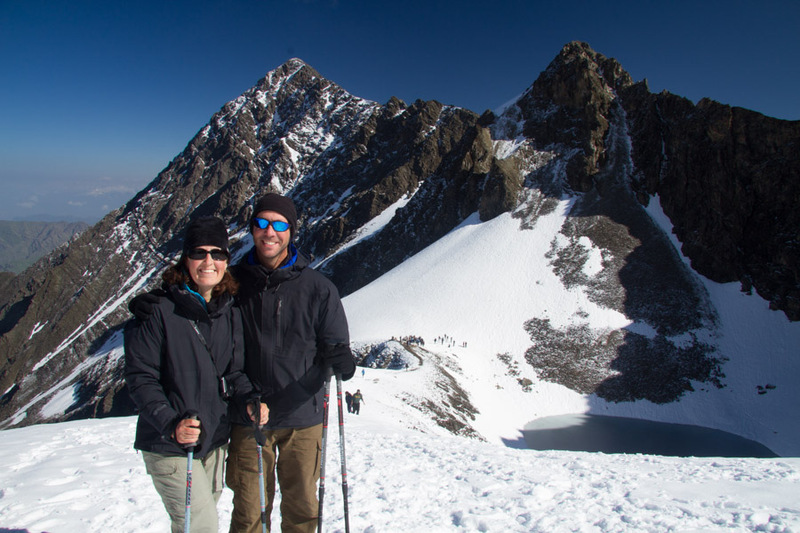 Regular readers here know that we have been on a mission to hike the world’s classic treks. 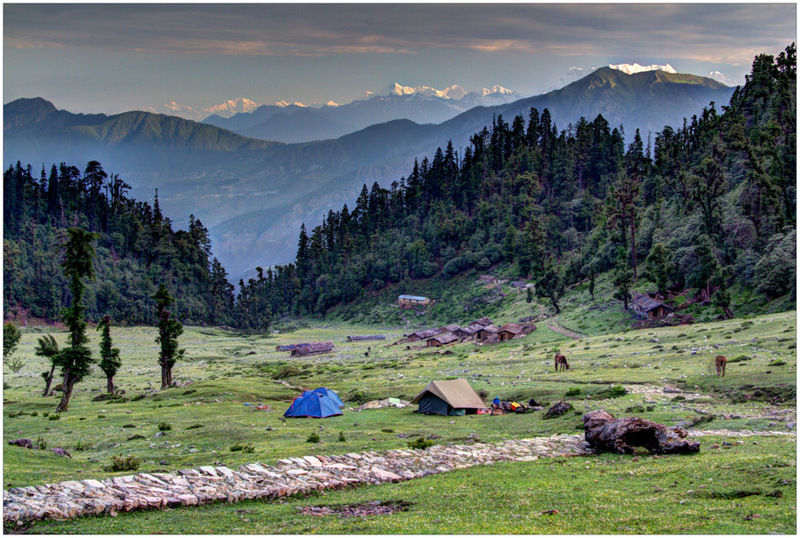 Although very popular with Indian trekkers, Uttarakhand hasn’t reached classic status yet. We only stumbled across this region while reading Lonely Planet’s Trekking in the Indian Himalaya. Uttarahkand is in northern India, right near the western border of Nepal. 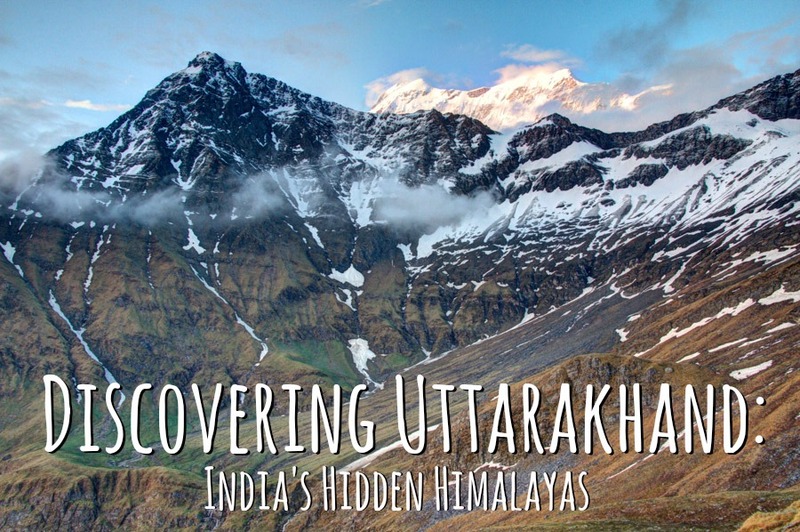 So, while its better-known trekking neighbor to the east draws oodles of hikers from all over the world, Uttarakhand hardly gets noticed, meaning that you’ll have this little corner of the Himalayas practically to yourself. We spent eleven days hiking beneath 7000-meter peaks on the Nanda Devi Alpine Trek, a marvelous hike that follows Lord Curzon’s Trail to Kuari Pass and then continues on to the sacred mountain lake Roopkund. Along the way, we passed through rhododendron forests, charming villages, and countless flocks of grazing sheep. We saw exotic flower species, colorful birds and impressive waterfalls. We traversed lofty mountain passes, took in spectacular vistas and savored the tranquility we found in the high alpine meadows or bugyals. And it was ours alone. We saw only three other trekking groups until reaching the final leg of our journey where we encountered lots of Indian hikers making the popular pilgrimage to the sacred lake of Roopkund. Other than that, our only interactions were with local villagers who often spend the summer months living in the mountains tending their flocks or foraging in the forests for valuable roots that can be sold in the markets of Nepal. All the locals we encountered seemed genuinely happy to meet us, and we enjoyed interacting with them and asking questions about their daily lives in this remote corner of the world. These lovely Garhwali women had been out in the forest all morning collecting fallen leaves to make bedding for their cows. They were resting their heavy baskets on a stone wall when we ran into them just outside of their village of Sartoli. Our guide, Dinesh, served as translator, and we asked them if we could see what carrying one of their baskets was like for ourselves. Up to that point, we thought our 20-pound daypacks were heavy, but these ladies were bearing some serious weight with their overflowing baskets. Who knew leaves could be so heavy? The hemp-rope straps certainly didn’t add to the comfort value, that’s for sure. We all got a big kick out of the experience, especially when the eldest of the group tried on my bag for size! When we stayed near villages, the locals often stopped by our camp to check us out, and we had fun enjoying our celebrity status. On a few occasions, Matt even taught the locals and our trekking crew to throw horseshoes with the many discarded horseshoes we collected along the trail during the day. Turns out the Garhwali are fun-loving, competitive and always up for a good game! And how could we ever forget the kids we met on Day 7 of the trek a few miles outside the village of Kunal? 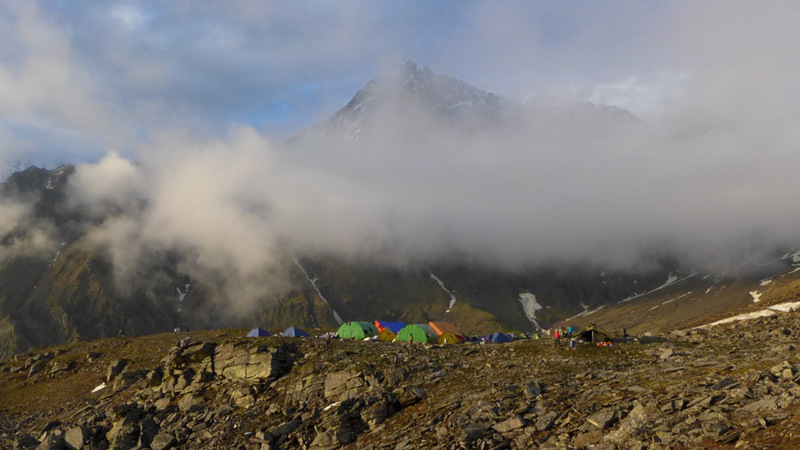 It was early in the afternoon when we stopped in a beautiful alpine meadow or bugyal to set up camp for the evening. On that particular day, we arrived earlier than normal, and our crew didn’t have the tents set up when we arrived, so we decided to check out the scene in the bugyal while they were getting everything arranged. This particular bugyal served as a summer camp for villagers from nearby Kunal, and their rustic wooden cabins lined the picturesque meadow. The bucolic scene seriously made us feel like we had stepped back in time, right into the middle of a Laura Ingalls Wilder novel. Only set in India. 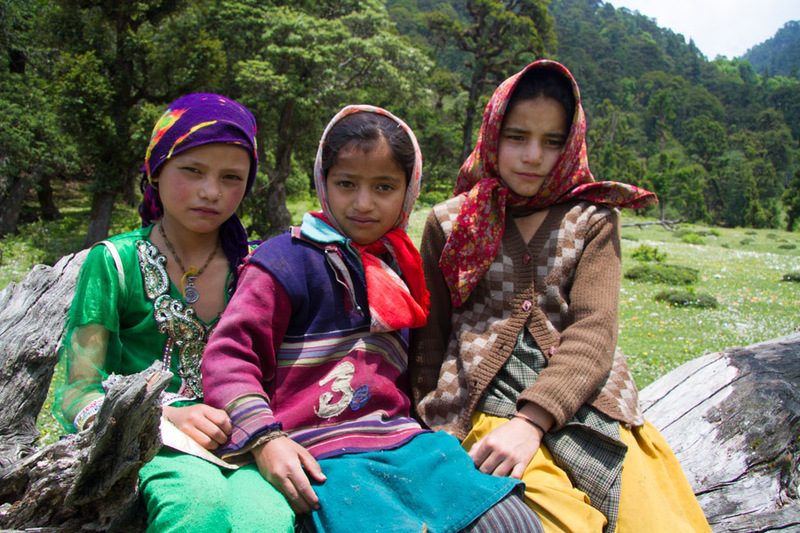 Before too long, our presence attracted the attention of three shepherd girls who were spying on us from nearby. Whenever we moved, the girls followed—from a safe distance, of course—always traveling single-file as if to remain invisible. If we happened to turn in their direction, the girls stopped dead in their tracks. Whoever happened to be leading the line at the time would stay exposed at the front, for as long as they could take it. Within a few seconds, they would lose their nerve and dart to safety at the back of the line leaving the next girl exposed. Their game was highly amusing to watch. Eventually, we made our way to a downed tree on the edge of the meadow and stopped for a rest. The girls’ curiosity got the better of them, and they edged closer and closer. They couldn’t have been more than ten years old, and they were dressed in layer upon layer of clothing, each article more colorful than the next. The girls finally made it to the tree and took a seat nearby. We waved hello, only to receive a chorus of giggles in response. The three colorfully-clad girls looked amazing perched on the tree on the edge of the bugyal, and we were dying to photograph them. They were super shy, though, so we knew pulling it off would be tricky. Sure enough, they practically ran for cover when I pulled my camera out of my bag. Not wanting to let this National Geographic moment slip through our fingers, we had to think of a way to break the ice quickly. I decided to take a photograph of Matt to see if the girls wanted to see it. When I showed them the LCD panel, they rushed around me to catch a glimpse of the image on the screen. Next, I gestured an offer to take a photo of them. With no hesitation, they clamored back up to their perch and eagerly posed for their chance to appear on the back of the camera. Click! And, with a run back to the camera to see their image, the girls were hooked. To show our appreciation, we wanted to let the girls get in on the fun, too. I helped each of them use the camera to take a picture of their two friends. They thought this was absolutely hysterical. They had been so serious when we took their photo, so it was fun to see their big smiles for a change. I think we could have played photography together all day, but, before long, the girls were called back to their cabins to do their afternoon chores. By this time, our camp was ready, so we headed over to our tent to read and chill out for a while. Before long, the girls were back, and this time, they had a group of shepherd boys with them. Matt and I decided we wanted to go for an afternoon walk to look for birds, and the children were keen on accompanying us. They pointed out lots of birds and enjoyed looking through our binoculars (we’re guessing perhaps for the first time ever). When we finally pulled out our cameras to photograph some of the beautiful species we were seeing, the children were beside themselves. Enough with the birds—this was the moment they had been waiting for. They eagerly posed for their portraits both individually and with each other. We were so grateful for all of these personal encounters with the locals of Uttarakhand, and it was an incredible feeling to have this undiscovered gem all to ourselves. What a rarity in this day and age! The last time we were in India was in the summer of 2001. That year, we spent a month in China before traveling to the sub-continent for the first time. We hired a driver and had a fascinating trip visiting Delhi, the Taj Mahal, and the colorful temple towns of Rajasthan. We braved a humbling camel safari before a quick sojourn to the Andaman Islands and then a final foray south to a family friend’s wedding in Chennai. By the end of our summer, we had experienced an incredibly vibrant culture but were exhausted and overwhelmed from the general frenzy and chaos of life in India. In the time since then, we’ve evolved a lot as travelers. We’ve learned to slow down quite a bit and now we design our vacations almost exclusively around the things we love to do most: hiking, camping, nature and photography. Not exactly the first thing that comes to mind when you think of India, is it? But, as our interest in international trekking has grown, we kept hearing about the marvelous hiking opportunities in India. We finally decided that we had to experience some of these incredible-sounding places for ourselves, so we booked our flights to Delhi. We have to admit that we were a bit nervous to return to India. While we enjoyed our first experience there, we were hesitant to go back. Given our love of nature, would we regret spending our summer in India? What would it be like to hike in such a densely-populated country? Would there be any nature to speak of? What if we were disappointed by the experience? Well, you will be pleased to know that trekking in Uttarakhand was a fantastic choice. This little corner of India seemed world’s away from the urban India we visited in 2001, and we were delighted to experience a different side of this diverse country, one that was remote, beautiful and peaceful—just exactly what we are looking for in our travels! Although it is possible (though not recommended) to hike in this area of the Himalayas on your own, we opted to use an outfitter and didn’t regret a single rupee of the cost. 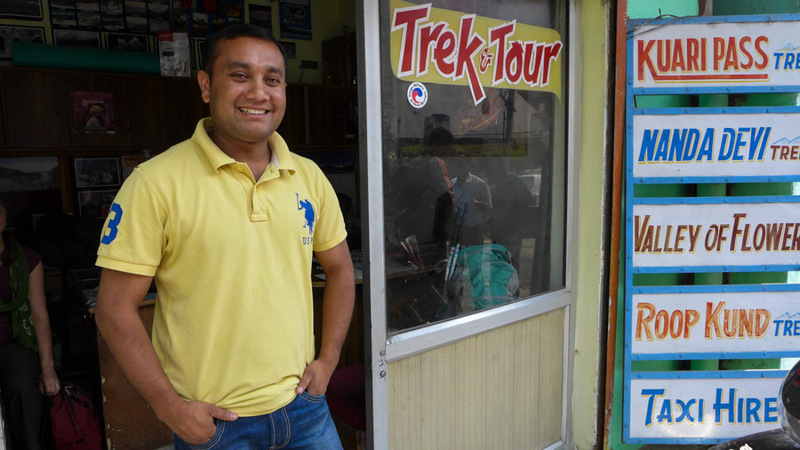 We found local outfitter Himalayan Snow Runner in Lonely Planet, and amiable owner, Ajay, was responsive and eager to customize an itinerary completely suited to our needs. From picking us up in the Delhi airport to arranging impromptu cooking lessons for us in his guesthouse in Joshimath, Ajay and the HSL staff did their best to make us feel welcome in their little corner of India. On the road between Delhi and Joshimath, we enjoyed an overnight pit stop in Rishikesh, a new-age enclave famed for a visit by the Beatles in the late 60s. After that, we spent a couple days relaxing and recovering from jet lag in Ajay’s cozy home, in addition to visiting some of Joshimath’s sights. On the trail, our crew treated our small group of three like royalty. (French Canadienne Virginie joined us in Joshimath.) Each morning, we were woken up with hot tea delivered to our tent, which was soon followed by “hot water for washing”—an amazing treat when you are facing going without a shower for eleven days straight. 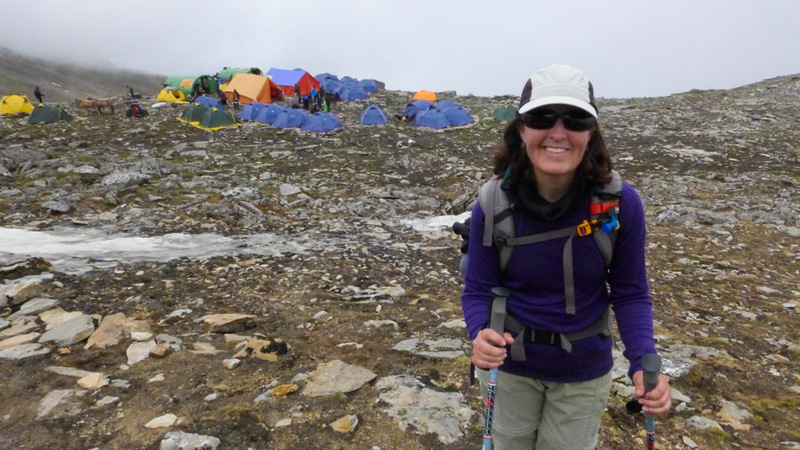 After a nourishing breakfast, we would empty our tent of our belongings and set out on the trail, while the crew stayed behind to load up all the gear. Along the trail, our guide, Dinesh, would find an ideal spot to pull out a tin dhaba and serve us delicious homemade curries and vegetables for lunch. This was always accompanied by chapati, rice and acchar (our favorite Indian condiment, a salty, spicy mango pickle) and then followed by addictively sweet chai. We swear that trail food doesn’t get any better than that! At some point during the day, our crew would pass us, so that when we arrived in camp hours after them, our home for the evening would already be set up. More wash water and chai would be delivered, then a late-afternoon snack, a scrumptious multi-course dinner and more chai. What a life we had! 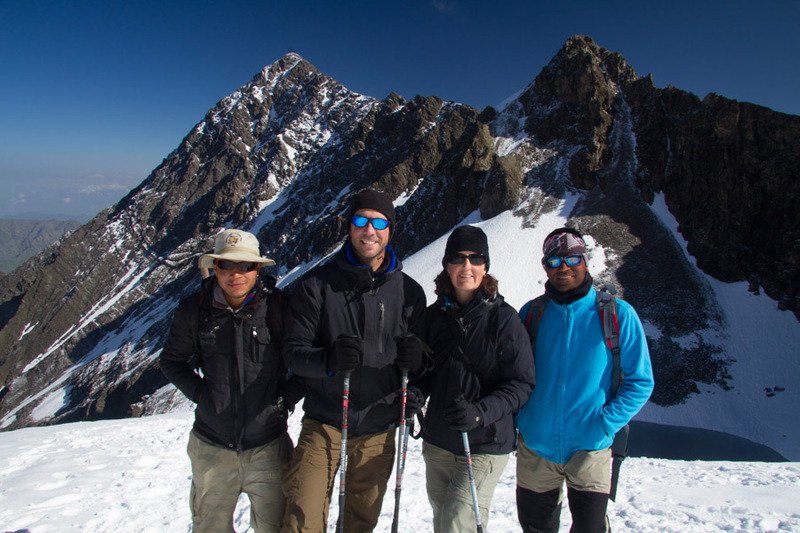 We spent most of our days hiking with Virginie, Dinesh and his assistant Kusal. Over 11 days, you get to know people pretty well, and it was hard to say good-bye to our new friends, especially after our experience together on Roopkund. 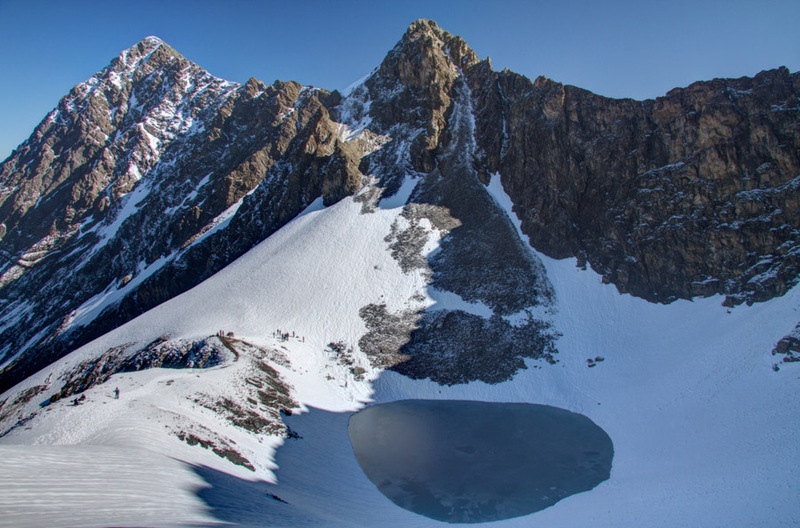 Roopkund is a high altitude glacial lake that lies just below the impressive 7120 meter Trishul massif. 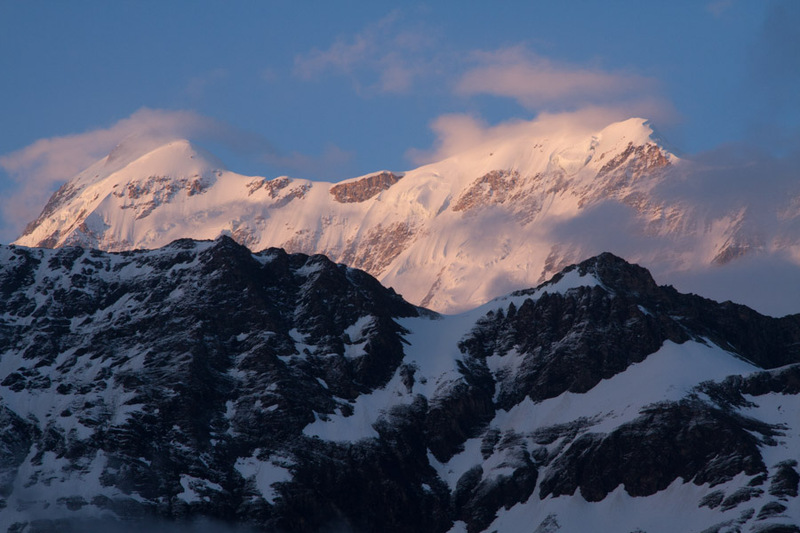 Although the scenery around Roopkund is undeniably spectacular, it’s actually something quite mysterious that draws Indian trekkers and pilgrims here year after year. In the 1940s, the skeletal remains of over 300 people were found in the lake. Nobody’s quite sure how they got there or whether the bones are from the 9th Century or the early 1900s. The remains can still be seen in the bottom of the lake, but only for a month-long period around July when the shallow water is not frozen solid. Pretty crazy, right? In the early morning of our trek to see the holy lake, the skies were reasonably clear. A fresh snow had fallen overnight, and the frost on the ground outside our tent offered a prelude to the slippery climb ahead. Still, after a brief breakfast and hot cup of chai, we hit the trail with trusty guides Dinesh and Kusal, determined to see the mysterious site for ourselves. 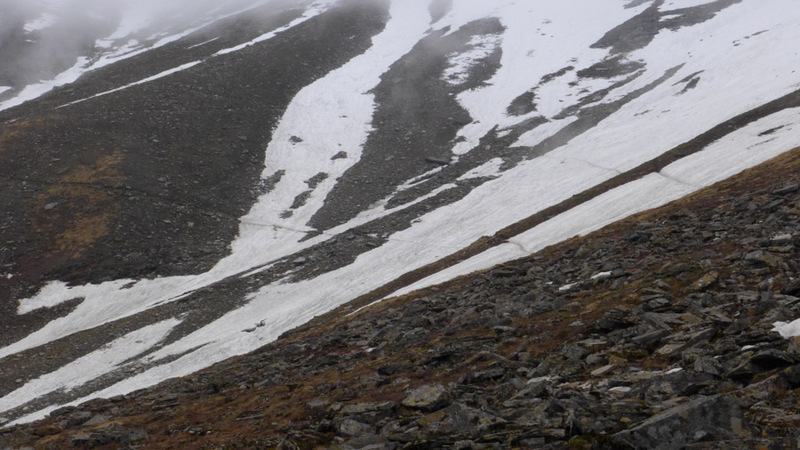 The trail up was alternately rocky and icy, interspersed with short snowfields that we crossed gingerly. Luckily, the snow in the early morning hours was relatively firm and offered some decent traction, especially since Kusal’s ice axe was the only form of spiky gear between the four of us. We made it up to the lake slowly but surely, and boy was it worth it. What greeted us at the top was a snow-covered expanse with Trishul in the background and the lake of Roopkund now below us, still frozen over and gleaming in the early morning sun. 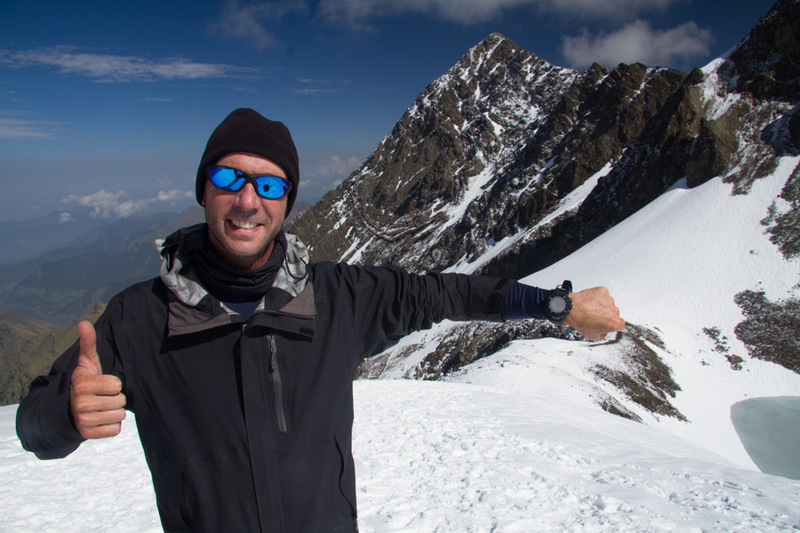 We were now at 4790 meters (15,715 feet) and feeling like we were on top of the world. Mission accomplished! We snapped several pictures, exchanged high fives with other hikers and enjoyed a brief snack. Dinesh and Kusal descended to the base of the lake where there is a small shrine to offer puja (prayer). We made the sign of “Om” in the snow and began our descent. This is where it got surprisingly difficult. As the sun rose, the snow grew more slushy, and the reverse descent turned out to be much more treacherous. With no crampons, we had to slowly pick our way down step by step. As the trail got more and more slippery, Kusal came to the rescue, using his axe to carve out each step so that we would have a level place for our foot to land. The slower we moved, the more precarious our situation became. 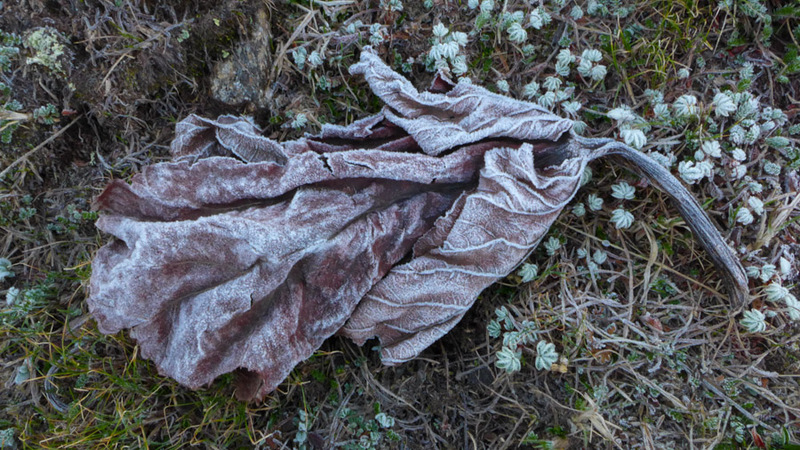 At one point, the trail traversed a long exposed snowfield that made us wary. A group of hikers passed us, so we had the benefit of watching them navigate the treacherous terrain. One by one, they each made their way across the snowfield; and, one by one, they each proceeded to slip in the exact same spot on the trail, lose their balance, and slide down the steep mountain slope on their keesters. They were all lucky to stop just before hitting a large boulder at the slope’s edge—undesirable, yes, but a far better option than continuing to slide for hundreds of yards down the side of the mountain. Not exactly what we were hoping for. Eventually it was our turn to pass. Fit, young and agile Kusal went first as we held our breath and watched. Sure enough, the second he reached the icy patch, he suffered the exact same fate as those preceding him. With the benefit of an ice axe, Kusal managed to flip onto his belly while sliding, dig the axe in and self-arrest about half-way before reaching the boulder. Next up was Matt, who decided to take his chances going off-trail a few feet above the icy patch. A good idea in theory, but, in reality, this meant that Matt was that much higher when he slipped. He started sliding down the slope right towards Kusal. Ever the loyal guide, Kusal was standing in tennis shoes on the slope, waiting for us to cross the slippery patch of ice. As soon as Matt fell, Kusal positioned himself like an NHL goalkeeper determined to block Matt, who was now rapidly approaching, totally out of control and unable to slow his avalanche-like velocity. Instead of “blocking the shot,” Matt upended Kusal (exactly like that old Charlie Brown cartoon when he tries in vain to kick the football), and both went skidding down the slope, stopping in a tangled mess mere inches before the boulder. With that, the writing on the wall was clear. Dinesh and I opted to avoid the icy patch altogether. We short-cut the slope and made it down to the battered hikers without too much excitement. Needless to say, we were grateful when we finally reached camp, desperate for a hot beverage and warm, dry clothing. We were thankful to the spirits of Nanda Devi for allowing us to experience Roopkund in such an adventurous fashion but even more appreciative of our loyal guides, Dinesh and Kusal, who went above and beyond—and sometimes even upside down—to make sure we had a fantastic experience in Uttarakhand! So, it is easy to see why we consider Uttarakhand a hidden gem in the Himalayas. Consider yourself officially “in the know” and get there before the secret gets out! Holy cow! What an amazing story and amazing, amazing photographs. It is always good to hear about new places, the ones that don’t attract as much attention and are less known. Although it plants seeds in my brain… dangerous, dangerous seeds. Now I will have to go read about the Wonderland Trail cause we are hiking it this summer! Thank you so much! We are thrilled that a trek in Uttarakhand sounds intriguing to you. We think those dangerous seeds are the best kind. 🙂 Good luck on the Wonderland Trail this summer! Hey, Alison and Matt, such nicely written blog and incredibly beautiful pictures. Loved that you both mingled with the locals! Thank you, Anagha! 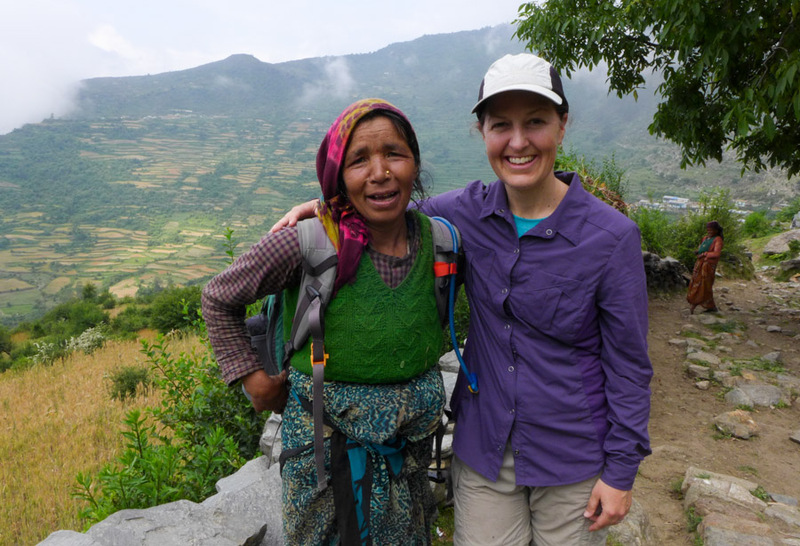 Meeting so many wonderful villagers on this trek was definitely a highlight of the experience for us. Those interactions are memories we will hold dearly forever! Namaste. Greetings from Himalayan Snow Runner. On behalf of all of us at Himalayan Snow Runner, a sincere “Thank You” for your kind words and heartfelt appreciation. People like you truly keep us motivated to do our best. Glad to read your wonderful travel blog with amazing pictures. 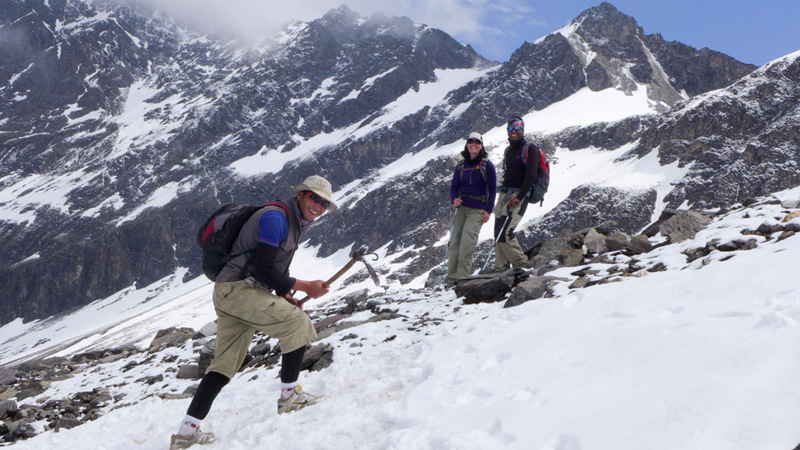 It beautifully unfolds your experiences on Nanda Devi Alpine Trek. I am happy that your first ever trip to Uttarakhand Indian Himalayas was such memorable. Look forward to an opportunity to welcome both of you again soon. It will be my pleasure to assist your friends when they wish to explore the pristine landscapes of Indian Himalayas. Keep in touch. So nice to hear from you, Ajay! We hope to return to Uttarakhand again sometime soon. We know there are lots more wonderful treks to do, and we wouldn’t want to experience them with anyone else. Congratulations on your new rooftop dining facility. We are sure it is wonderful! Great post! Looks like you had another wonderful trek. I really loved all those photos of the cute kids you met. Nicely done! The kids were a real highlight for us, Andy. We’re glad that you enjoyed their photos! We are going to print them out and see if there is a way we can get the photos to them. Hi Matt and Alison! Another great post from around the world. It makes me wish I were 30 years younger. I loved the pix of the little girls and the story of Matt’s fall from grace. Did you laugh at the Charlie Brown scene? or were you too scared for them? (Maybe laugh later?) Beautiful photos. Worth every step of carrying the 20 pounds. Thank you! We weren’t laughing at the time, but the saying: “Misery + Time = Comedy” definitely rings true here. I wish we had captured it all on videotape. I am positive that video would have gone viral! Thanks so much, Carolyn! Uttarakhand is a beautiful place. It’s almost impossible to take a bad photo there. We hope you will get to visit it some day! Nicely written blog and great pictures, I belongs to uttrakhand and its great to hear such a nice words for our ppls and places. I have never visited those places but eagerly waiting to vist after reading such a nice blog!! Thanks, AJ. You are lucky to call such a beautiful place home. Definitely hit those trails as soon as you can! All of your posts are so thorough and informative. I will bookmark this next time I’m planning to go to India. Trekking in the Himalayas has always been high on my list but this looks more appealing than Nepal. You went in June, it looks like. Do you know what the trekking is like in October/November? Awesome photos as usual. I love the photos of the people you saw along the way. Those are excellent shots. Trekking in Nepal is great, too, but there are definitely fewer foreign hikers in the Indian Himalaya. 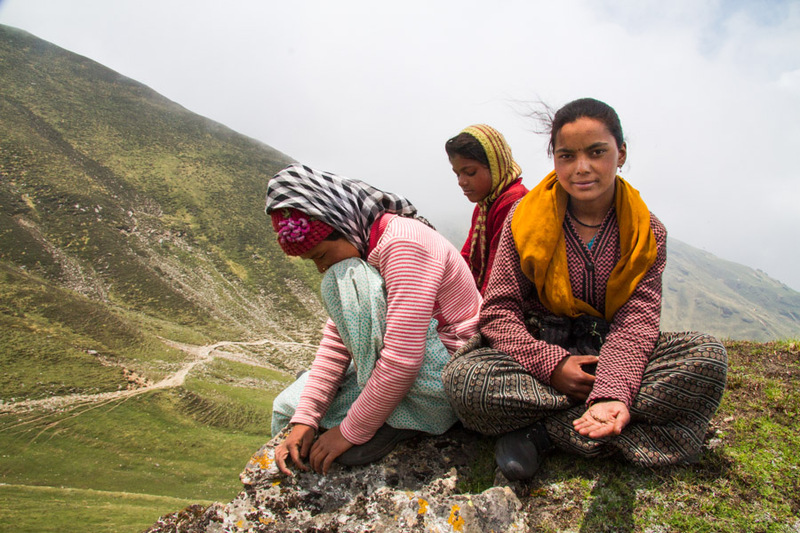 Summer is ideal for hiking in arid Ladakh, but Uttarakhand has a monsoon season like Nepal. April-May and September-October are supposed to be the best months to hike this area. If you are serious about hiking in the Himalayas, try to check out the new film “Meru.” It is a documentary about climbing, but it is really well done and has incredible footage of the alpine scenery in Uttarakhand. We highly recommend it! Hi Dinesh! So nice to hear from you after all this time. I hope all is well with you and the HSR crew. We absolutely loved our experience with you in Uttarakhand and hope to trek with you again some day. Cheers!